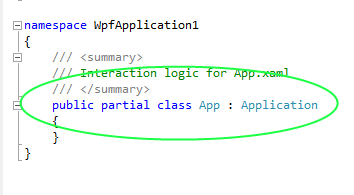 The root element in a XAML file can have an x:Class attribute that specifies how to find the code-behind associated with the class being defined in the markup. When you build your project, the XAML is compiled and two things occur: 1) the XAML is converted into tokenized binary BAML; and 2) code is generated (e.g. C#) which will serve as a partial class that matches the partial class for your code-behind. Notice that the value of the Class attribute matches the name of the corresponding class.